I paid a visit to Thomas Collins and Jim Carthy’s farm, in Rush, recently, and Jim gave me some information on his growing season for cucumbers. A link to my visit here. It was very interesting to learn that Irish Cucumbers are available from Mid February to Mid November. That’s a nine month season in which to buy Irish cucumbers! They are grown in a very controlled environment, in glass houses. While other countries produce numerous varieties, with various colours, shapes and sizes, there is only one variety grown in Ireland. They are those dark green ones, stocked by every vegetable retailer and the darker the skin colour, the better, according to Jim. If the cucumbers are turning yellow, they have passed their best before date. 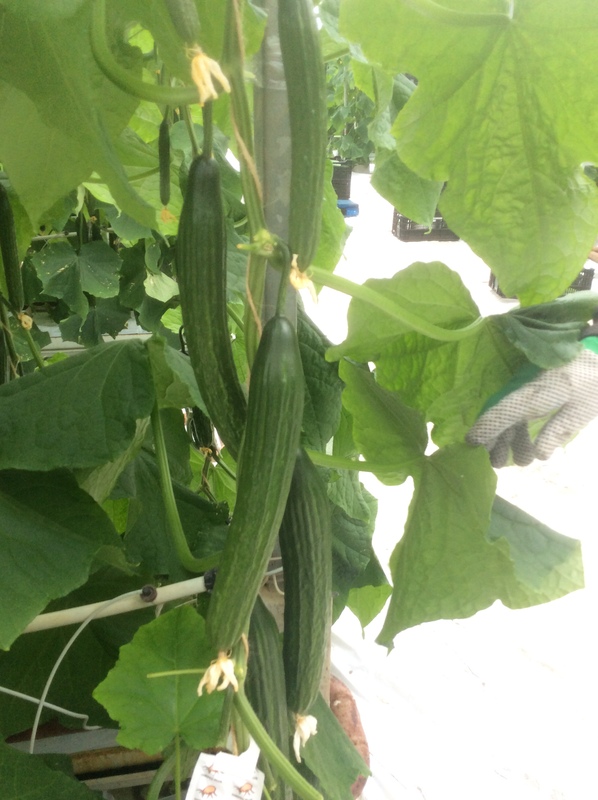 Amongst the growers, they are known as ‘English Cucumbers’. 95% are eaten raw, either sliced or chunky as part of a salad, or added to yoghurt or sour cream, with seasoning and/or grated garlic to make excellent dips or sauces. A suggestion is to serve slices in a bowl of cider vinegar, to be added to salads or cut into julienne slices and serve with dips. The there are the uses of cucumbers as a natural beauty treatment. Tired eyes and dark circles under the eyes benefit greatly from about 10 to 15 minutes with a slice of cucumber over each eye. Purreed cucumber can also be used as a mild facial astringent. Cucumbers have virtually no fat, are low in carbohydrates and have a beneficial range of vitamins and trace minerals. They have a high proportion of Vitamin K, which helps with bone strength. Remember, most of the vitamin content is in the skin! I should mention the other variety of cucumbers eaten here. These are the pickled types, variously known as: Gerkins, Pickles and Cornichons. As these are not grown here is any quantity, but come here already processed, I will leave them out of this post.